For other uses, see Caramel (disambiguation). Caramel (/ˈkærəmɛl/, /ˈkɛrəmɛl/ or /ˈkɑːrməl/) is a medium to dark-orange confectionery product made by heating a variety of sugars. It can be used as a flavoring in puddings and desserts, as a filling in bonbons, or as a topping for ice cream and custard. The process of caramelization consists of heating sugar slowly to around 170 °C (338 °F). As the sugar heats, the molecules break down and re-form into compounds with a characteristic color and flavor. A variety of candies, desserts, and confections are made with caramel: brittles, nougats, pralines, flan, crème brûlée, crème caramel, and caramel apples. Ice creams sometimes are flavored with or contain swirls of caramel. The English word comes from French caramel, borrowed from Spanish caramelo (18th century), itself possibly from Portuguese caramel. Most likely that comes from Late Latin calamellus 'sugar cane', a diminutive of calamus 'reed, cane', itself from Greek κάλαμος. Less likely, it comes from a Medieval Latin cannamella, from canna 'cane' + mella 'honey'. Finally, some dictionaries connect it to an Arabic kora-moħalláh 'ball of sweet'. Caramel sauce is made by mixing caramelized sugar with cream. Depending on the intended application, additional ingredients such as butter, fruit purees, liquors, or vanilla can be used. Caramel sauce is used in a variety of desserts, though most notably as a topping for ice cream. 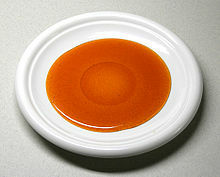 When it is used for crème caramel or flan, it is known as clear caramel and only contains caramelized sugar and water. Butterscotch sauce is made with dark brown sugar, butter, and often a splash of whiskey. Traditionally, butterscotch is a hard candy more in line with a toffee, with the suffix "scotch" meaning "to score". Milk caramel manufactured as square candies, either for eating or for melting down. Toffee, sometimes called "caramel candy", is a soft, dense, chewy candy made by boiling a mixture of milk or cream, sugar(s), glucose, butter, and vanilla (or vanilla flavoring). The sugar and glucose are heated separately to reach 130 °C (270 °F); the cream and butter are then added which cools the mixture. The mixture is then stirred and reheated until it reaches 120 °C (250 °F). Upon completion of cooking, vanilla or any additional flavorings and salt are added. Adding the vanilla or flavorings earlier would result in them burning off at the high temperatures. Adding salt earlier in the process would result in inverting the sugars as they cooked. Alternatively, all ingredients may be cooked together. In this procedure, the mixture is not heated above the firm ball stage (120 °C [250 °F]), so that caramelization of the milk occurs. This temperature is not high enough to caramelize sugar and this type of candy is often called milk caramel or cream caramel. Salted caramel is a variety of caramel produced in the same way as regular caramel, but with larger amounts of salt added during preparation. Originally utilised in desserts, the confection has seen wide use elsewhere, including in hot chocolate and spirits such as vodka. A study conducted in 2017 by the University of Florida suggested that the popularity of salted caramel is due to its chemical composition, as all of its main ingredients have effects on the reward systems of the human brain, resulting in a process described as "hedonic escalation". Caramel colouring, a dark, bitter liquid, is the highly concentrated product of near total caramelization, used commercially as food and beverage colouring, e.g., in cola. Caramelization is the removal of water from a sugar, proceeding to isomerization and polymerization of the sugars into various high-molecular-weight compounds. Compounds such as difructose anhydride may be created from the monosaccharides after water loss. Fragmentation reactions result in low-molecular-weight compounds that may be volatile and may contribute to flavor. Polymerization reactions lead to larger-molecular-weight compounds that contribute to the dark-brown color. In modern recipes and in commercial production, glucose (from corn syrup or wheat) or invert sugar is added to prevent crystallization, making up 10%–50% of the sugars by mass. "Wet caramels" made by heating sucrose and water instead of sucrose alone produce their own invert sugar due to thermal reaction, but not necessarily enough to prevent crystallization in traditional recipes. ^ New Oxford American Dictionary (3rd ed.). New York: Oxford University Press. 2010. p. 260. ^ The American Heritage Dictionary of the English Language (5th ed.). Boston: Houghton Mifflin Harcourt. 2011. p. 278. ^ CondeNet. "Salted Caramel Ice Cream". Epicurious.com. ^ American Heritage Dictionary, 5th edition, 2011, s.v. ^ Oxford English Dictionary, 1st edition, 1888, s.v. ^ Littré, Dictionnaire de la langue française, s.v. ^ The arguments are summarized in Paget Toynbee, "Cennamella"--"Caramel"--"Canamell", The Academy, 34:864:338, November 24, 1888. ^ Young, Sarah. "Why you can't stop eating salted caramel, according to science". The Independent. Retrieved 1 March 2018. ^ "6. Sugar confectionery". Food and Agriculture Organization of the United Nations. Retrieved 2013-01-01. ^ "Nutrient data for 19364, Toppings, butterscotch or caramel". National Nutrient Database for Standard Reference. USDA, ARS, NAL, Nutrient Data Laboratory. This page was last edited on 18 April 2019, at 02:53 (UTC).